Thanks to a new in-school initiative, CyberTitan, students throughout New Brunswick can now learn the ins and outs of cybersecurity while they’re still in post-secondary education. Students can participate in fun, hands-on learning environment that better prepares them for future education and better equips them with skills for a career in cybersecurity. Last spring, CyberTitan students were offered an extra special job opportunity with Bulletproof, promising employment to two cyber enthusiasts who were preparing to graduate from High School and pursuing higher education in this field. Qualified students were encouraged to submit their resumes, transcripts and essays highlighting why they’d like to pursue a career in the cybersecurity field of work. Although many shining stars applied, two shone above the rest, Dakota Staples, and Noah Clements. 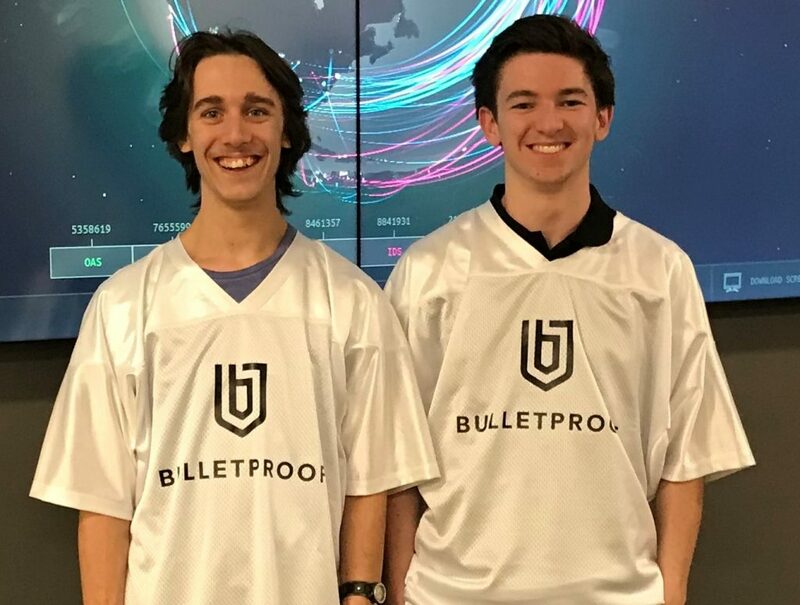 The two students started working out of Bulletproof’s state-of-the-art Security Operations Centre in Fredericton over their summer break and continued work with Bulletproof part-time while attending classes at the University of New Brunswick (UNB). Both students are working towards their Bachelor of Computer Science Degrees. This is a first for Bulletproof said their supervisor Denis Ryan. Information and Communications Technology Council (ICTC) introduced Canada’s Cyber Security Education Initiative, CyberTitan in 2016, in affiliation with the Air Force Association’s CyberPartriot Program. This program helps bridge the gap for younger generations to start thinking about cybersecurity as a career choice; especially with a global shortfall of 1.8 million cybersecurity professionals expected by 2022 (source). By providing co-op opportunities, students can explore the world of cybersecurity and learn skills related to the industry. Meet our two students, Dakota Staples (left) and Noah Clements (right) and hear their experiences with the program so far. 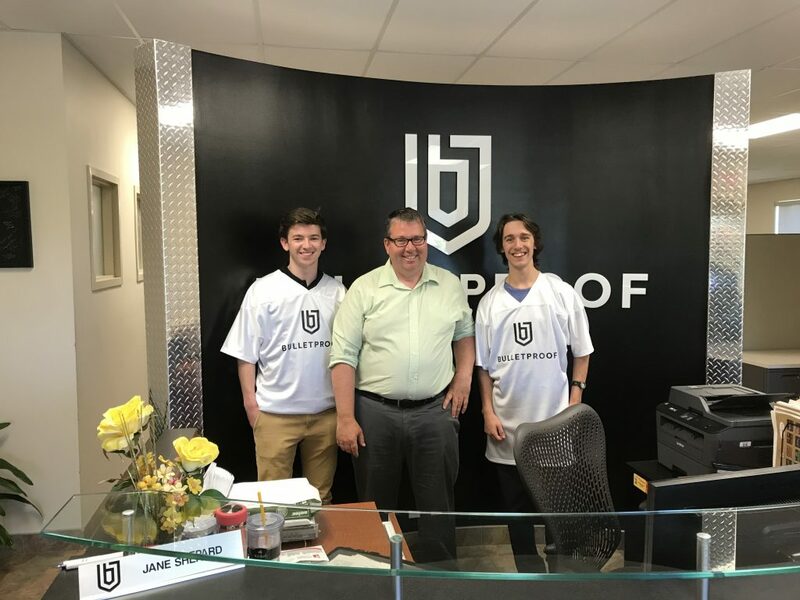 The second photo features both students with Bulletproof’s Co-Founder and COO, Jeff Shaw at our Fredericton Office during an office tour. Dakota Staples, recent graduate and valedictorian of Nackawic High School has moved on to UNB, where he is currently studying computer science. Computers have interested him for a long time, he said. “Recently I took an interest in cybersecurity, and this opportunity was a great chance to have employment in my chosen field and passion,” said Staples. Staples wasn’t new to Bulletproof though, he initially started as a virtual co-op student, where he discovered his passion for cybersecurity, completing a comprehensive security exam at the end of his placement to test his knowledge. Outside of work and school, Staples does squeeze in some time for fun, where he plays video games, participates in sports and goes four-wheeling, he said. Alongside Staples, new hire Noah Clements is also making Bulletproof proud. Clements graduated from Fredericton High School with a Focus on Information Technology (FIT) Certificate, a program designed to teach students real ICT skills while completing secondary education. Clements now studies computer science at UNB, which he indicated has been his goal to pursue since elementary school. When Clements isn’t busy studying, or working, he likes to spend his free time playing video games with his friends, creating music and going on adventures. Bulletproof is always looking for new opportunities to inspire future generations; to learn more about Bulletproof’s virtual co-op program, CyberTitan or any student opportunities please contact us. Looking to expand your skill set? Explore our Fall courses and see what December courses might be good fit for you! We offer a variety of virtual instructor-led training, including: Adobe, Crystal Reports, Business skills, Six Sigma, SQL, Business Analysis, SharePoint, Office 365, Power BI, Microsoft Server, Cisco, Security and lots more!